The Toyota-Ford hybrid pickup tie-up seemed perfect. 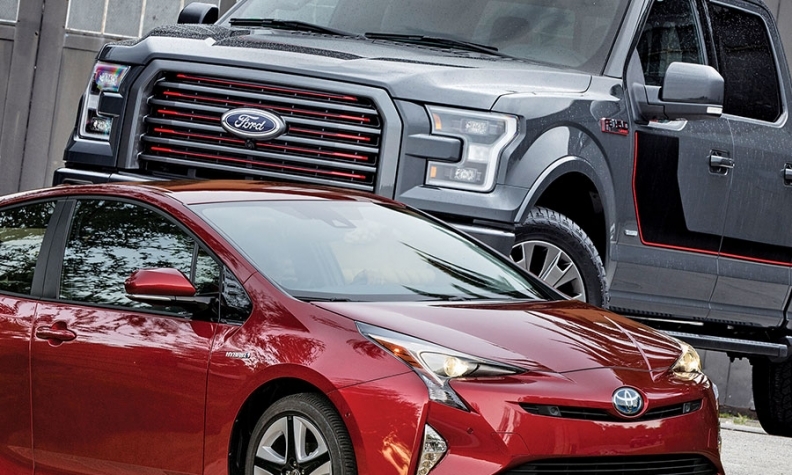 Toyota's Prius is the best-selling hybrid, Ford's F series the most popular large pickup. TOKYO -- Long after a much-ballyhooed Toyota-Ford hybrid pickup partnership unraveled, the ill will lingers. Toyota Motor Corp.'s powertrain chief says Ford Motor Co. didn't exactly steal Toyota's hallmark technology. But he insists his counterparts in Dearborn, Mich., milked the exchange for all they could before abruptly ending talks with Toyota's blueprints in hand. Now the race is on between two champions: one in hybrids, the other in pickups. Toyota thinks hybrid pickups will be needed soon, and its engineers are busy working on them. Ford, meanwhile, plans its own hybrid pickup by 2020. The outcome could shape industry strategies in one of the hottest, most profitable vehicle segments and help determine how both companies meet increasingly stringent emissions regulations. "This is a very competitive segment, and if one OEM receives a boost in sales with such an offering, the rest will surely soon follow," said Devin Lindsay, principal analyst at IHS Automotive. He said hybrid pickups could arrive as soon as 2017. When Toyota and Ford unveiled plans for a hybrid pickup tie-up in 2011, it seemed like a perfect dovetailing of their strengths. Ford sells the nation's best-selling large pickup: the F series. Toyota sells the world's best-selling hybrid: the Prius, with sales of more than 3.5 million worldwide since its 1997 introduction. But two years later, Ford dumped the project, opting to go solo. To hear Toyota's side of the story, it didn't end amicably. Toyota's Saga has suggested Ford used talks to tap Toyota's hybrid expertise. 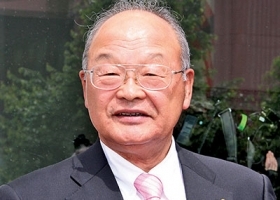 Koei Saga, senior managing officer in charge of Toyota's powertrain division, said the project progressed quite far and that Toyota was stunned when Ford decided to pull the plug. Speaking on the eve of the Tokyo Motor Show in late October, he suggested Ford had simply used the talks to tap Toyota's hybrid expertise. "Because we proposed everything," Saga said. "Well, I don't know whether they stole, but we proposed all the technologies we had. It even went as far as the drawings." When Ford bailed, they took those ideas with them, he added. "Technologically, we went far, and the engineers of both companies agreed that that technology was good enough to do it," Saga said. "But ultimately, the Ford management made a decision, and it fell apart. I really regret it, and I'm very sorry." Ford spokesman Said Deep said the U.S. automaker's decision was based on the outcome of the feasibility study. Ford found its own technology better suited for a rear-wheel-drive hybrid system in its pickups and SUVs, he said, without offering specifics or responding directly to Saga's remarks. "We remain on plan to bring our new hybrid system to market by the end of this decade," Deep said, adding that the system will deliver truck and SUV capability with far greater fuel economy. Ford already has 150 patents related to its system and another 230 pending, he said. 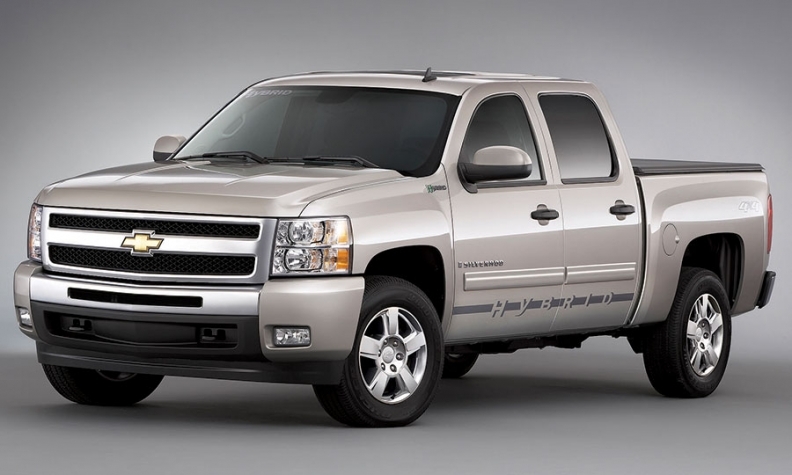 General Motors pioneered hybrid pickups with the Silverado Hybrid. But it was killed off in 2011, highlighting the hurdles faced by such vehicles. It was not the first time Toyota had pondered hybrid pickups. "We have planned that so many times, and we came up with the models," Saga said. "But whenever the gasoline price falls, everybody in the U.S. goes back to using gasoline." What is different this time: Ever-stricter fuel economy rules are expected to make adding hybrids all but mandatory. "You cannot clear or pass the regulations just by making the trucks lighter," Saga said. Ford already has switched to an aluminum-bodied F series largely to slash weight and save fuel. Saga declined to give a timeline for a Toyota hybrid pickup. But he said the maker of the full-size Tundra and midsize Tacoma pickups would likely need hybrids in the "near future." Future pickups may even need to swap their V-8 engines for downsized turbocharged V-6s teamed with hybrid hardware, he added. In any case, the market is expected to be little more than a niche, at least at first. Hybrid pickups should account for just 6 percent of the already tiny hybrid market by 2020, IHS Automotive predicts. But carmakers nonetheless are expected to turn to them in order to meet 2025 federal corporate average fuel economy standards. General Motors pioneered the idea with a hybrid version of the full-size Chevrolet Silverado. But that slow-seller was killed off in 2011, highlighting the hurdles faced by hybrid pickups. The systems are complex and expensive. They also need to deliver at least the same hauling power as a nonhybrid. Part of the problem: A pickup hybrid system has to be much more powerful and robust than a passenger car's. But that only adds extra weight to a truck package that's already heavy to begin with. Moreover, hybrids' biggest selling point, fuel economy, is not the top priority for old-school pickup buyers. "It is hard to imagine that the traditional base will be drawn to the hybrid technology unless the increase in efficiency comes at little additional cost and without sacrificing capability," said Jessica Caldwell, senior analyst at Edmunds.com. Ford has some advantages in the hybrid pickup race against Toyota. For starters, its lead in pickup development and brand value may exceed Toyota's lead in hybrid technology. "As challenging as hybrid development might be, it's not nearly as challenging as converting full-size truck buyers from a well-established domestic brand to a relatively new import brand," said Karl Brauer, senior director at Kelley Blue Book. Ford already has a huge and fiercely loyal customer base to tap when the technology finally reaches its prime, Brauer said. Last year, Ford sold 753,851 F-series pickups in the U.S., making it not only the best-selling pickup but also the best-selling vehicle, period. Toyota mustered Tundra sales of only 118,493. But Toyota may have the upper hand in appealing to drivers already predisposed to considering hybrids. "Hybrid pickup trucks will have a very difficult time winning over traditional pickup truck drivers," said Eric Lyman, vice president of industry insights at TrueCar Inc. "Toyota probably has the edge on Ford among intenders for their brand." In either case, hybrid pickups likely will amount to just a fraction of the overall CAFE equation for a long time. "A superior strategy," Lyman said, "would be to optimize efficiency and promote sales of small cars rather than expect pickup-truck buyers to migrate toward hybrid technology. Nick Bunkley and Mike Colias contributed to this report.